Longmont, Colorado. August 27, 2014 – Only two weeks after the launch of WorldView 3, DigitalGlobe, Inc. has released its first images from the super-spectral, high-resolution commercial imaging satellite. WorldView-3 offers highly precise imagery that automatically distinguish different colors and textures and measure change over time, which is important for the energy sector, conservationists, and governments. In one example image, individual shipping containers can easily be counted and measured which is valuable information for monitoring economic activity and trends at various marine ports, airports, rail yards and other logistics hubs. The satellite carries an atmospheric instrument called CAVIS (Cloud, Aerosol, water Vapor, Ice, Snow). Built by Ball Aerospace & Technologies Corp., CAVIS is designed to monitor the atmosphere and provide correction data to improve satellite imagery when it images Earth objects through haze, soot and dust. WorldView-3 was successfully launched on August 13 on a United Launch Alliance-built Atlas V rocket from Vandenberg Air Force Base, California. On August 19, DigitalGlobe completed commissioning of the satellite bus and opened the door on the main telescope. On August 21, the company completed focusing of the optical sensor and achieved Initial Operational Capability (“IOC”) on WorldView-3’s entire suite of 27 spectral bands. The satellite will continue its calibration and validation program for several months before beginning commercial operations. “We are delighted that even in the early stages of calibration and commissioning WorldView-3 is revealing new insights that will enable customers to address some of the most pressing global challenges. WorldView-3 performance is exceeding our expectations and is a great step forward in helping our customers make critical decisions with confidence as they save lives, resources and time,” said Jeff Tarr, Chief Executive Officer of DigitalGlobe. Due to regulatory restrictions, DigitalGlobe can’t yet display the 30 cm native resolution data, so they’ve shared imagery resampled to 40 cm. DigitalGlobe formally notified the U.S. National Oceanic and Atmospheric Administration (NOAA) of WorldView-3’s IOC, which means that beginning on February 21, 2015, they will able to deliver 30 cm imagery to their customers. In the meantime, they’ll make 40 cm panchromatic and 1.6 m multispectral data available to customers when WorldView-3 completes its validation and testing. 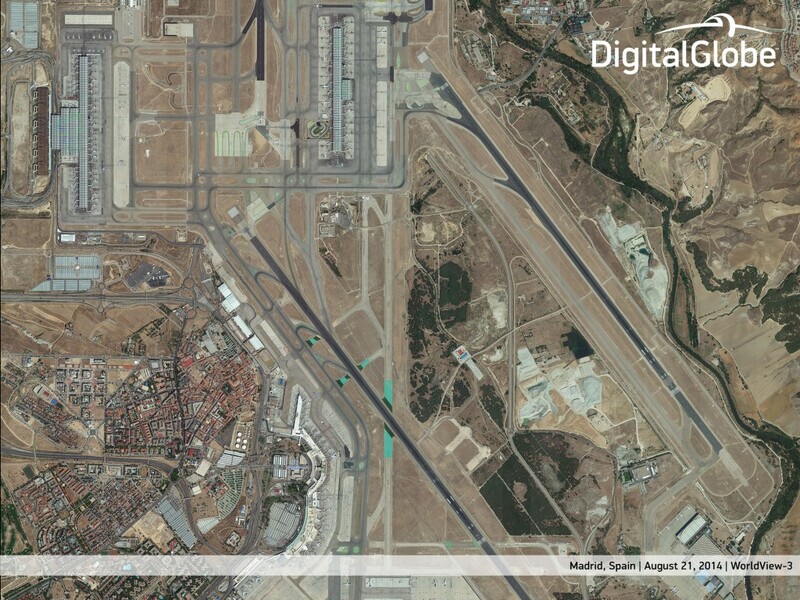 To view sample images, visit the DigitalGlobe blog.